Looking for something that's simple but well made? Do you love shiny hardware? Plain Collar Leather or Suede collar with removable O-Ring. Includes a steel buckle with leather strap for adjustable fitting. 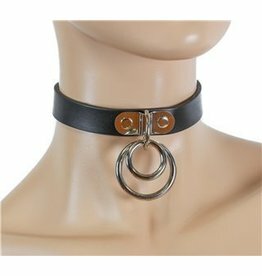 Black leather collar with double rings. Looking for a well made harness, with a g-string back? Look no further the Jaguar fits the bill.